What Are My Rights Against Age Discrimination? Several states have laws that prohibit employers from discriminating on the basis of age. 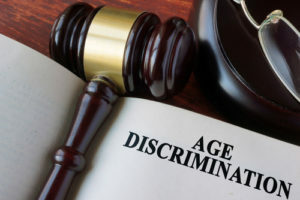 In addition, the federal Age Discrimination in Employment Act (ADEA) and other laws also prohibit age discrimination and protect several rights for employees. Under the ADEA, employers may not discriminate against employees who are 40 years of age or older. This prohibition is in place during every stage of the hiring and employment process. It covers job postings, interview, hiring, compensation, promotion and demotion, evaluation and discipline, training, job assignments, and termination. The ADEA not only prohibits employers from overtly discriminating (for instance, by saying “no workers over age 40 need apply” in their job postings), but also from taking steps that look neutral but that have a disproportionately negative impact on older workers or treat them less favorably than younger workers. It also prohibits employers from discriminating among older workers – for instance, under the ADEA, an employer may not hire a 45 year old instead of a 55 year old solely because the 45 year old is younger. The ADEA applies to private employers with 20 or more employees. It also applies to federal and local governments. While state governments must also comply with the ADEA, state employees are not always able to sue their employers directly for ADEA violations. The federal Older Workers Benefits Protection Act (OWBPA) added provisions about benefits and retirement to the ADEA, preventing ADEA-covered employers from discriminating in benefits and retirement options provided to older workers. Generally, this means employers cannot choose to give different benefits or retirement plans to workers over 40 than those provided to workers under 40. While age discrimination is prohibited by law, instances do occur. An experienced employment law attorney can help you understand your rights in your specific situation and fight illegal treatment. To learn more, contact the attorneys at Rudnick, Addonizio, Pappa & Casazza today. Call us locally at 732.264.4400 or toll-free at 866.567.0135. Is Early Discharge Medical Malpractice?